Turn an Italain Pandoro into a layered dessert stuffed with a cream cheese filling, nuts and cranberries. Pandoro is an Italian yeast bread that is quite popular during the holidays. The bread is tall, fluted and somewhat cone shaped in that it is smaller at the top than the bottom. My friend, Giovanni Collucci, visiting from Italy, described a simple way to turn a Pandoro into a fancy dessert. By slicing the pandoro into multiple layers and then reassembling it with a cream cheese filling, you create a decadent sweet treat that's a prefect finish for a holiday dinner. Place granulated sugar, water and cranberries in a small saucepan. Bring to a boil and stir until sugar has fully dissolved. Boil for an additional 3 minutes. Remove from heat and cover for 1 hour. After an hour, strain the liquid into a container and refrigerate. Spread the cranberries out on a paper towel and cover with a second towel. Press to remove as much liquid a possible. Set aside. Place the pandoro on a serving plate. If it is tilting a bit, slice off a bit of the bottom at an angle to level it. Then, slice the pandoro into 5 equal layers. Set them on a baking sheet. Sprinkle a tablespoon or so of simple syrup onto each layer. Don't over soak them. You may have a good amount of simple syrup left. Store any extra in the refrigerator and use it to sweeten tea or in mixed drinks. Whip the cream cheese in a large mixing bowl. Add vanilla, orange and lemon zest, and 1/2 cup of powdered sugar and continue to whip until light and smooth. Separately, whip the heavy cream until stiff peaks form. Fold the whipping cream into the cream cheese until fully combined. Put the mixture into a pastry bag or large disposable bag and cut off about 1" on one of the corners. Place the largest slice of pandoro on a serving plate. Pipe about 1/4 of the topping onto the slice, being sure to cover all the outer edges. Sprinkle about 1/4 of the almonds on top and once agin cover the pointed edges. Place the next layer on top but rotate it slightly so that the points of this slice are in between the points of the lower slice. Add the topping and almonds similarly to the first layer. Add the next layer and repeat the process until you've place the last layer on top. 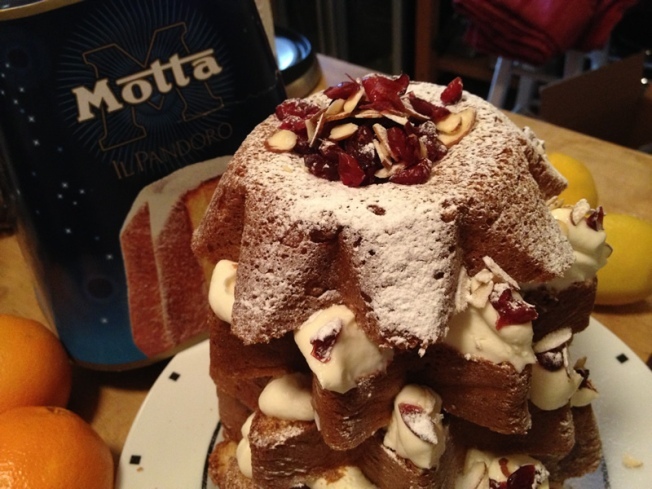 Using a powdered sugar shaker or a wire mesh stainer, dust the entire pandoro. Place a bit of the cranberries on each of the exposed points on each layer and mound the remainder on top. Sprinkle any leftover almonds on top as well and then give the dessert one final light dusting. Serve immediately or refrigerate. Thanks to my friend, Giovanni, for sharing this tasty holiday dessert idea. If you have any comments or questions, please send me an email at wayne@waynesweekend.com or follow me on Facebook or Twitter.